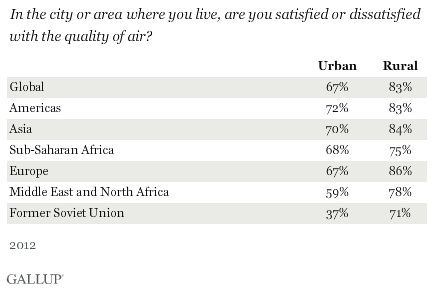 WASHINGTON, D.C. -- People's satisfaction with the quality of the air in the city or area where they live remained relatively high worldwide in 2012. Nearly four in five adults (78%) reported being content with air quality where they live, in line with what Gallup has measured since 2008. In 2012, Asia (81%) and Europe (79%) led the way in overall satisfaction with air quality, while residents of the Middle East and North Africa (66%) and former Soviet Union countries (60%) rated their air the worst. At the national level, European and Asian countries dominate the list of places where people are most satisfied with their air quality. For the second consecutive year, Ireland rates among the world's most satisfied, with 93% of Irish residents expressing satisfaction with their quality of air. Sri Lankans (94%), New Zealanders (92%), Finns (92%), Australians (92%), and Nepali (92%) rate their air quality similarly high. More recently, bushfires outside of Sydney have led the government to issue public health warnings in Australia's largest city as air quality reaches hazardous levels. At the opposite end of the spectrum, the countries where people are least satisfied with their air quality hail from a varied set of regions and developmental levels. Among the world's least satisfied are countries as geographically and economically diverse as Hong Kong (34%), Lebanon (43%), Malta (52%), Haiti (53%), and Russia (54%). For the second year in a row, Hong Kongers remain the least satisfied in the world with their air quality. As one of the most densely populated areas in the world, Hong Kong suffers from a perfect storm of air quality concerns, including high traffic, a preponderance of coal-fired power stations, and a location adjacent to one of China's industrial heartlands. Despite the rapid pace of economic growth in some BRIC nations, majorities remain satisfied with air quality in India (84%), China (77%), and Brazil (68%). In urban areas, people living in the Americas (72%) and Asia (70%) report the highest levels of satisfaction. While residents of rural areas rate their air quality better in all regions, nowhere is the gap between urban and rural greater than in countries of the former Soviet Union (37% vs. 71%). Former Soviet Union countries have had to contend with high levels of rural flight toward urban areas in recent years, complicating efforts to deal with the Soviet legacy of environmental recklessness and a lack of industrial sector investment. Satisfaction with air quality stays largely consistent among all three levels of human development categories, including countries with very high human development (80%), high/medium development (77%), and low development (79%). Though highly industrialized countries produce greater emissions, those industrialized countries considered to have very high human development, such as European Union countries, are also more likely to have stronger environmental policies. By contrast, relatively undeveloped countries tend to have larger rural populations living away from the urban nuisances of vehicle emissions and smog. Air quality remains a significant health and developmental issue worldwide. In October, the World Health Organization (WHO) released a report that estimated air pollution to be responsible for more than 3 million premature deaths in 2010. While air pollution is already known to contribute to respiratory and heart disease, WHO took the extra step of officially labeling air pollution as carcinogenic and a leading environmental cause of cancer for the first time. Efforts to mitigate air pollution are especially urgent when viewed alongside climate change. Just as air pollution contributes to climate change, scientists expect climate change to add to air quality woes in the future. According to the Intergovernmental Panel on Climate Change, without international efforts to cut emissions, global air quality in cities -- where Gallup data show residents are already the least satisfied with their air quality -- will decline in the future as a result of climate change. Results are based on telephone and face-to-face interviews with 1,000 adults, aged 15 and older, conducted in 135 countries in 2012. For results based on the total sample of national adults, one can say with 95% confidence that the maximum margin of sampling error ranged from a low of ±1.7 percentage points to a high of ±4.2 percentage points. The margin of error reflects the influence of data weighting. In addition to sampling error, question wording and practical difficulties in conducting surveys can introduce error or bias into the findings of public opinion polls.